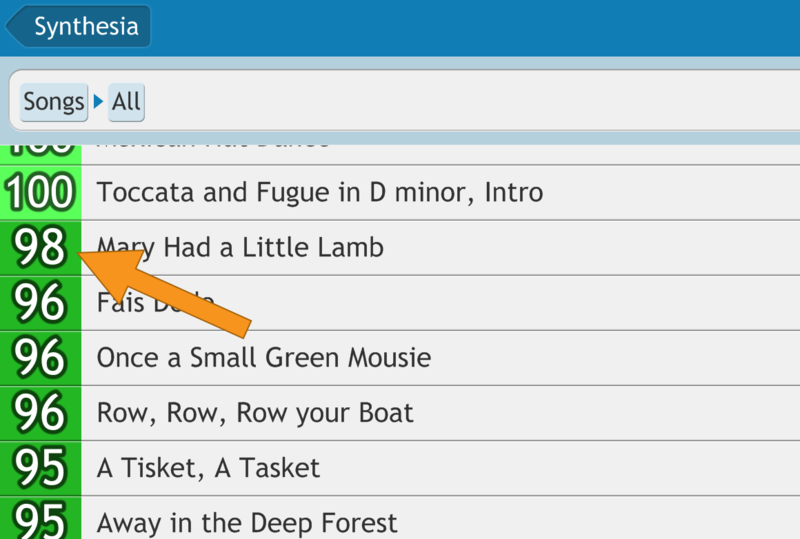 In this guide, we're going to look at how to navigate, search, organize/sort, and delete songs in Synthesia's Song List. Synthesia organizes its built-in songs into groups (shown in orange and blue). Other songs that you add will appear below the groups. The number to the left of a group is the average of your progress for all the songs inside that group. The numbers to the left show your current progress for each song, out of 100 points. Use the path bar to navigate out of groups. Just click the name of the group you'd like to see instead. Select a song by clicking or tapping the song title. Then, listen to a preview by using the play/pause button at the top of the screen. Once you've found a song you'd like to play, click the Continue button at the top right. 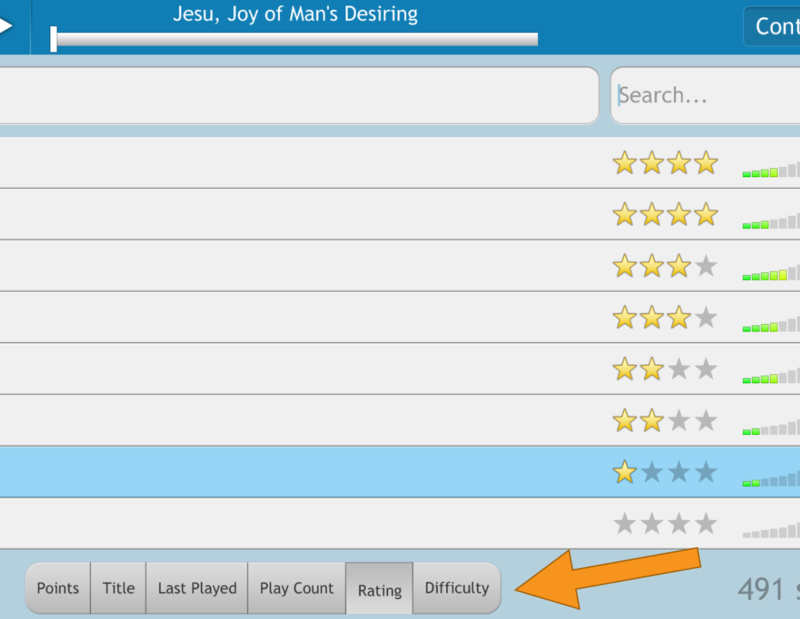 Each song has a rating and difficulty. 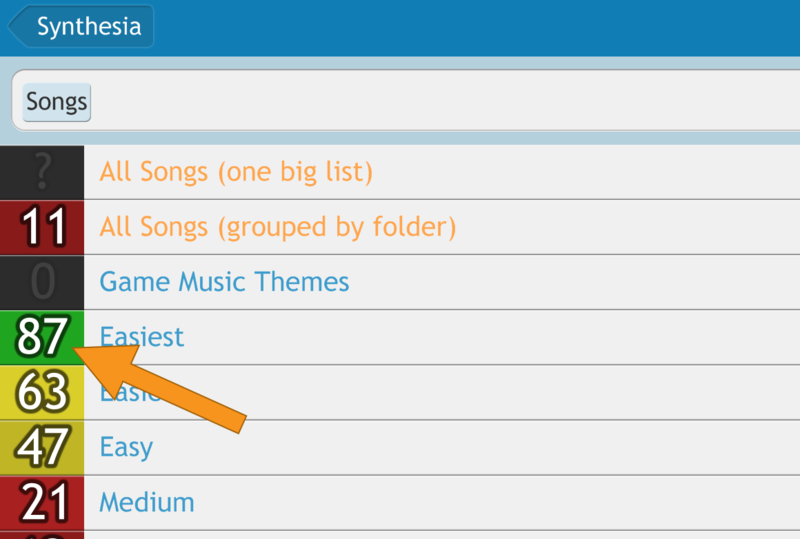 You can set these however you like to help organize your songs, described next. Just click the stars or difficulty to adjust things. Choose the order songs should appear by picking one of the options at the bottom of the screen. 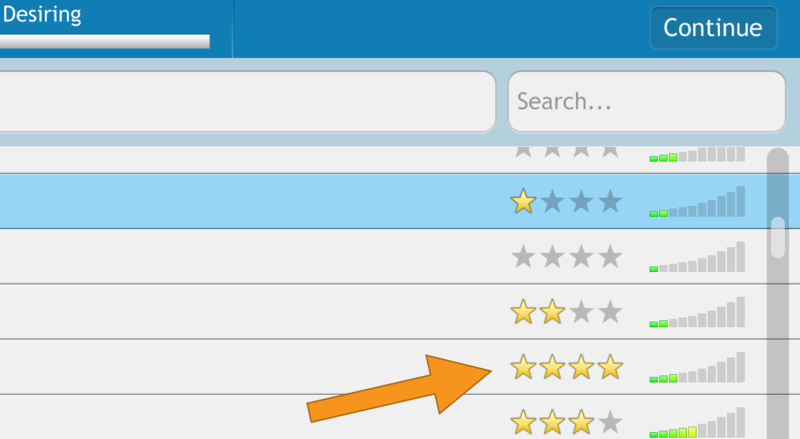 You can sort by points, song title, when the song was last played, how many times it has been played, the rating you assigned, or by the difficulty. Click or tap the same choice again to reverse the sort direction. 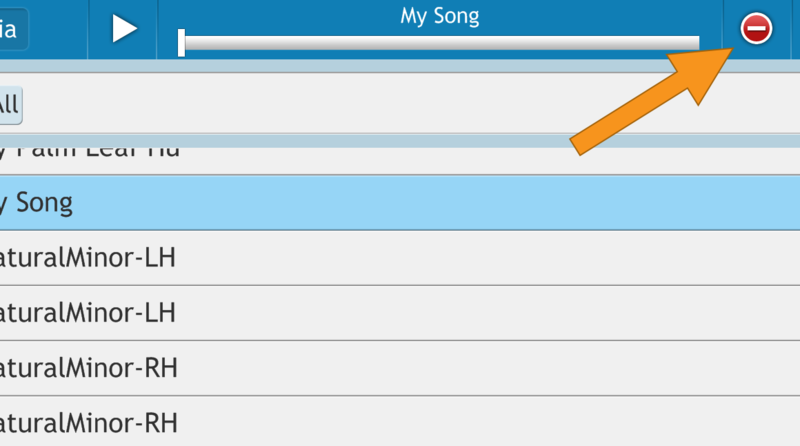 For example, picking "Title" a second time will show the songs in Z-to-A order (instead of A-to-Z). You can delete a song by selecting it and clicking the red icon that appears to the right of the preview bar. In Synthesia for PC or Mac, this will send the song to your Recycle Bin (or Trash). In Synthesia for Android or iPad, the song will be deleted permanently after you confirm. Note: Built-in songs cannot be deleted. To hide the songs that are included with Synthesia, visit Settings » Songs, select the "Built-in Songs" entry and choose "Hide them". 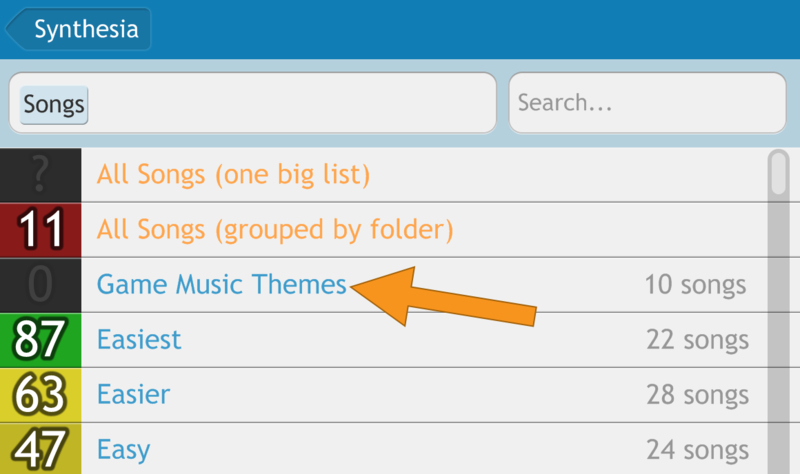 Use the search bar at the top right to find songs quickly. As you type, the list is filtered down to show only the songs that contain the words you've entered. If you're looking for a song but don't know which group it's in, the fastest way to find it is to head over to the orange "All Songs (one big list)" group and use the search bar. 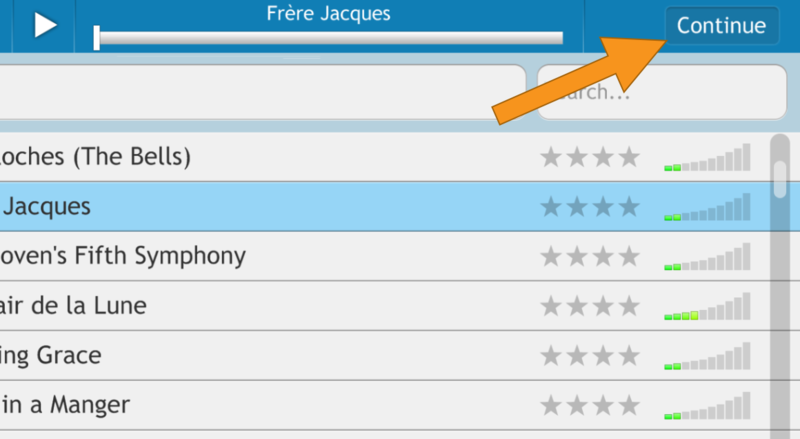 Advanced: You can search extra hidden data by typing things like "composer:Mozart", "arranger:Gilbert", or "tags:videogame". If this hidden metadata interests you, check out Creating Great Content for Synthesia.